Viewpoint is the colourful and entertaining magazine of the BSHS. 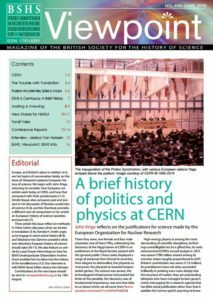 Launched in its present form in 2006, it appears as an A4-format publication aimed at a broad readership, featuring articles, opinions, reviews and interviews addressing the history of science, technology and medicine, and drawing on the Society’s Outreach and Education activities. Viewpoint is published three times a year, in February, June and October. 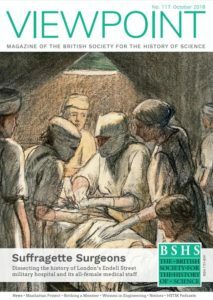 Enquiries about circulation, including subscription requests, should be sent to the BSHS Executive Secretary at [email protected] Viewpoint is free to all BSHS members and is priced at £12.00 per year for non-members based in the UK and £17 a year for overseas non-members. Hazel Blair is a doctoral researcher at the University of Lausanne in Switzerland. Hazel took up editorship of Viewpoint in December 2017, having previously been Assistant Editor of London-based magazine Military History Monthly. Prior to her doctorate and her editorial work, she completed an undergraduate degree in Medieval History at the University of St Andrews and an MA in Medieval and Renaissance Studies at University College London (part-funded by the BSHS via the Society’s MA bursary scheme). All contributions and correspondence should be sent to the Editor, Hazel Blair, at [email protected]. Instructions for contributors can be found in pdf here. The Editor will always consider advertisements regarding new appointments but, as a general rule, other advertisements are not printed in this publication. However, for an appropriate charge, leaflets advertising suitable events, publications, etc, can be sent out with Viewpoint subject to size and postage restrictions. Full details are available from the BSHS Executive Secretary. selection of responses to this question. 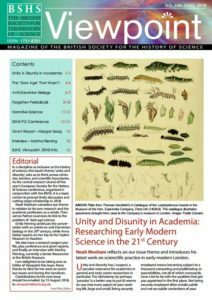 This issue commemorates the 2018 centenary of women’s suffrage in the UK with a collection of articles on women in the history of science. This issue’s theme is unity and disunity. 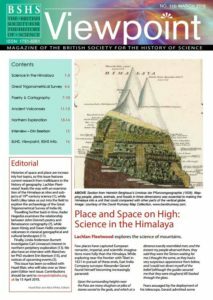 This issue looks at space and place, featuring research in the history of geography. 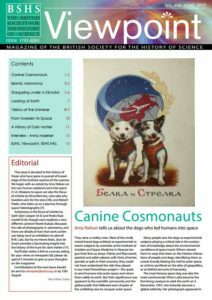 This issue is devoted to the history of those who have gone in pursuit of knowledge of the furthest reaches of the cosmos. 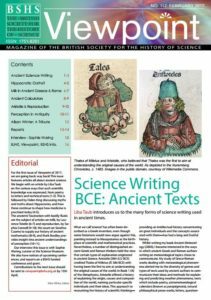 We’ve got ancient science writing, a piece on medical ethics, then and now, and an in-depth analysis of the myriad meanings of milk throughout history! 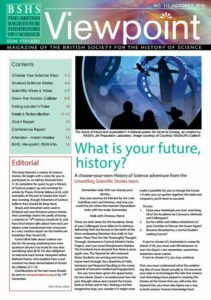 A choose-your-own History of Science adventure, featuring articles on stories and the field! 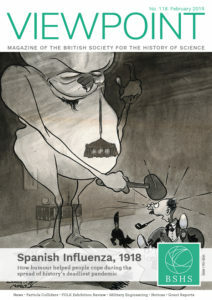 Viewpoint explores European history of science! 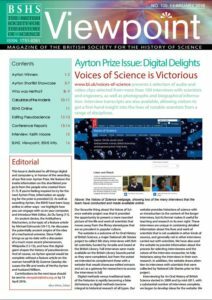 To whet your appetite for the online copy of issue 109, the special Ayrton Issue on digital histsci, we bring you a bonus feature article! Professor Chris Green of the University of York highlights some of the digital methods being pioneered to study the history of psychological science by the “PsyBorgs”. Click here to visit the Archive of Viewpoint issues and related news.